An urban waterside oasis, Paddington Central is all about creating a space that enables our community to work smarter, stay active and live well. As part of this, we’re launching an innovative Clear Air Zone designed to decrease everyday pollution and help to create a cleaner, healthier neighbourhood for everyone. From smoke-free environments to limiting traffic pollution, welcome to one of the greenest areas in the heart of London and a backdrop that encourages businesses and people to flourish. 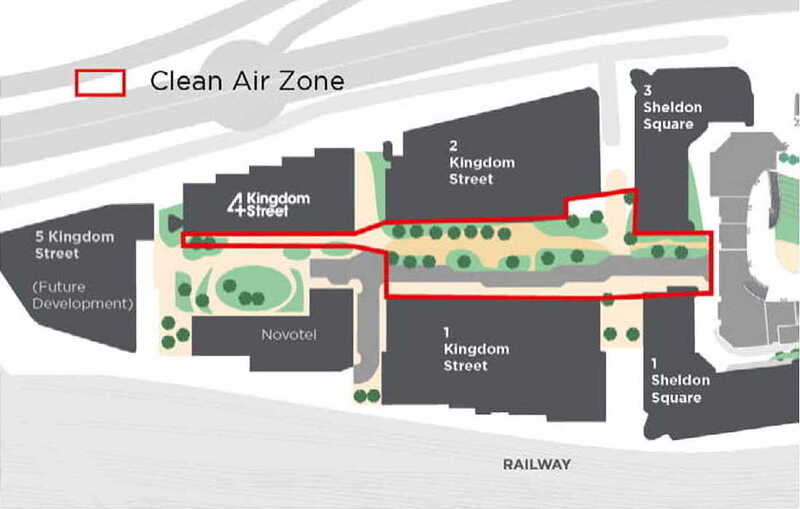 We discourage vaping and smoking in the areas highlighted on the map and kindly ask for you to oblige and use other areas around the campus so that everyone can enjoy the clean air of Kingdom Street. Thank you and have a clean air day.